Jacob Gerhardt, who contributed this piece, is a professional cyclist for Team CLIF Bar. With a schedule that is mostly comprised of criterium racing, Jacob can be found traveling the world with his teammates. When he is not on the road, Jacob resides along the Central Coast of California, an ideal landscape for logging miles and bagging adventures, all while finding a quality balance. Nestled deep in the hills above Ventura, California, the city of Ojai is a haven for local ranchers, big-city transplants and passerby motorcycle crews alike. With Sisar Mountain to the north and Sulphur Mountain to the south, this high-desert landscape is the setting of a story narrated by jagged rock formations and budding cacti on a pastel canvas. It almost makes you forget about its proximity to the ocean and the bustling cities below. The ocean - a softer touch and innate contrast to this land of hard-fought adventure. When Pacific waves run perpendicular to Highway 33, you're almost there. Twelve miles east of Ventura lives the town of Ojai. A perfect, untapped well of adventure that will be the setting of this next great adventure experience - The Gravel Mob. Rolling into Ojai the night before the ride, myself and my teammate from Team Clif Bar, Miles Lemon, found ourselves at the Deer Lodge talking with locals and partaking in some delicious grub and, of course, our fair share of booze. After walking the streets and visiting some of the local establishments, we set up camp at the Lake Casitas campground. Menso de Jong, from Team Clif Bar. Photo: Peloton. The 6 a.m. wake up came too soon and the cold was a bit shocking even for a California winter. We made our way into town and got our numbers and instructions at the Mob Shop, before cruising across the street for a cup of coffee at Beacon Coffee Roasters, where we filled up with coffee and pastries that would fuel the next 4.5 hours. Lining up with close to 200 gravel riding enthusiasts, there were two loops, an option for a shorter 30-mile loop or the full length 58-mile loop. After an 8-mile neutral roll, we lined up for the “official” start of the Mob. As the group began to climb Sulphur Mountain, it quickly thinned to a lead group and a scattering of individual riders up and down the mountain. The initial climb, Sulphur Mountain, gave expansive views of the ocean and town of Ojai. With nine miles of consistent fire-road gradient, the chill of the morning was quickly gone, as was the front group of riders. Finishing with a steep paved segment, the group came to the first feed zone. With a quick refill of water and food, the ride continued down the backside of Sulphur Mountain, weaving in and out of the oak canopy on a well paved, flowing downhill. After crossing Highway 150, at the base of the valley, the ride turned uphill once again on a rough singletrack, and the final monster climb began. At eight miles, the Sisar Mountain climb proved to be a challenge to all, with only a handful of competitors breaking the one-hour time mark on the climb. 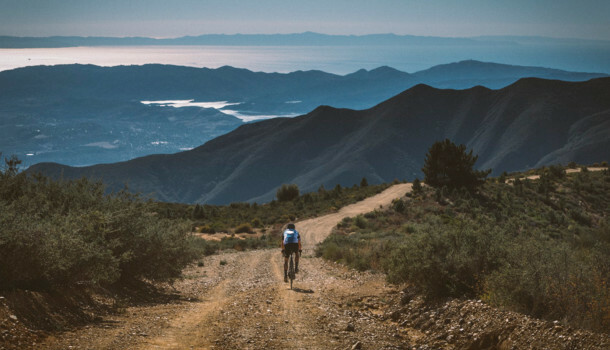 After summiting, the ride proceeded along the ridge including a singletrack descent, which eventually connected with Highway 33, a handful of miles from downtown Ojai. The route then weaved through town and into the parking lot of the Ojai Mob Shop where riders were greeted by a taco stand and homemade tortillas. After refueling on tacos, riders were treated to a raffle with varying prizes. 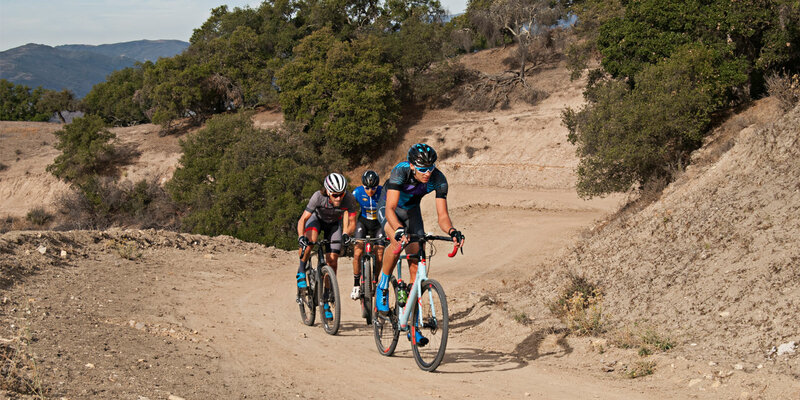 Given the geographical situation of the city of Ojai, it lends itself to extremely steep, rough, and remote terrain, making it an ideal stop for gravel riding enthusiasts of any caliber. Be prepared to put in miles of climbing in order to be rewarded with epic descents. The Ojai Gravel Mob provided a much needed break from the high-energy, fast-paced world of criterium racing that is the meat of what I train for and race when I saddle up. I will definitely be back and more prepared for the adventure that is the Ojai Gravel Mob.